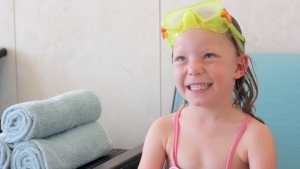 A few weeks ago, Jay Goldberg strode into the hotel pool room with his three wide-eyed children to find eight mermaids and four sharks perched on the pool ledge. They watched in surprise as the group dove in to play Sharks and Mermaids amidst screams and splashes. Sure enough, an employee from Fin Fun approached to explain why they had invaded the hotel’s pool—for a product photo shoot. Now it was Fin Fun’s turn to be surprised. Not only had the Goldberg’s figured out their identity, they were customers! “I had no idea they were based here,” Goldberg said. He and his family, from Utah, were passing through Idaho Falls, Idaho, after a weekend in Jackson Hole, Wyoming. 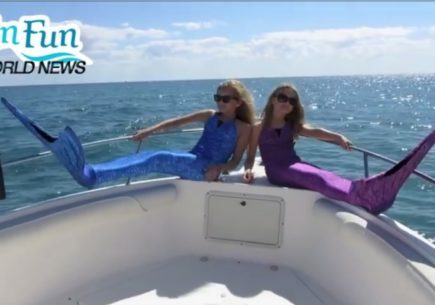 His daughters, Olivia, 7, and Brooke, 5, are currently addicted to the mermaid world. 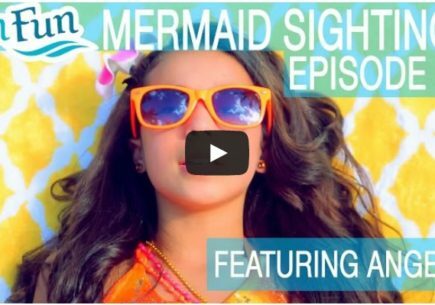 In April, Olivia had a mermaid birthday party, of course—complete with mermaid cake, beach buckets, and a mermaid tail towel that Goldberg’s mother made. Brooke got one too. “They love them. They absolutely love them,” he said. 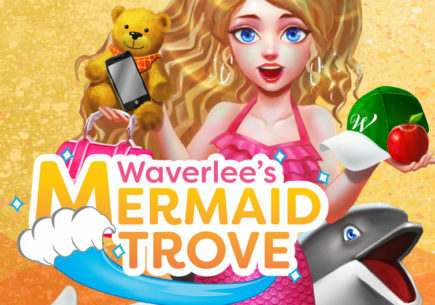 “Brooke, she loves it, but Olivia—her life is mermaids,” Goldberg said. Goldberg says they are at the pool three or four times a week. 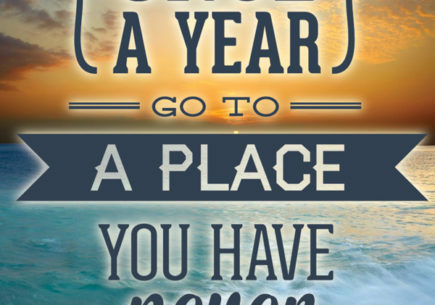 “I swim ten days a week,” Brooke said. 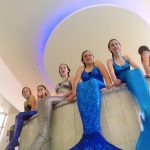 “They’re really rugged,” Goldberg said about the mermaid tails. Though he and his wife don’t let them into the hot tub because it’s more chlorinated, they have been pleased with the product, its comfort, and durability. The girls have had a lot of fun. They usually take them everywhere they go. Goldberg thought it would have been even more amusing if they had walked in on the Fin Fun photo shoot while wearing their own tails. He says Olivia is hopelessly addicted to the show “H20 Just Add Water.” She pretends she is one of the mermaids and Goldberg says Olivia is often in the corner of the pool talking to her imaginary mermaid friends. She even used her tooth fairy money to buy a locket like the girls have in the show. “I like mermaids because they swim, and I like to swim,” Olivia said. 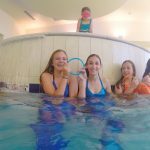 The girls were invited to join the mermaids in the pool and they even got in a few of the photos as well! I was born a mermaid. 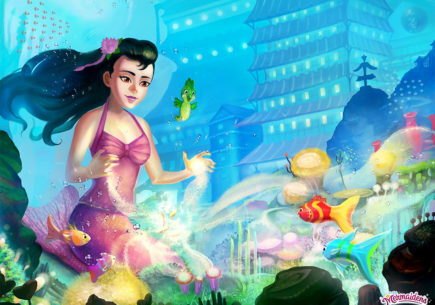 When I was like four, I tried mermaid potions to become a mermaid, but now that I found Fin Fun, I bought an Asian Magenta Mermaid Tail. Aussie Green. 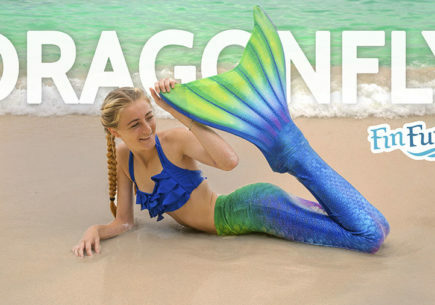 Me too, I have brown hair, and I have a Aussie Green mermaid tail. 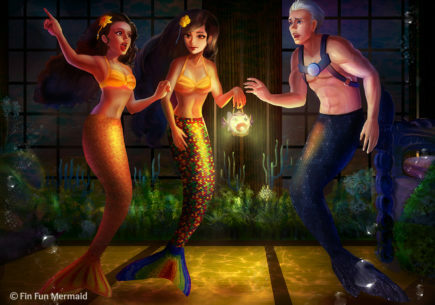 i am thinking about being a mermaid for halloween do you think that i should be a mermaid for halloween !! 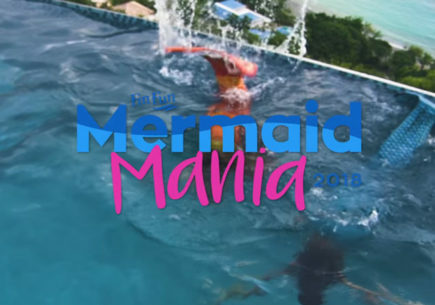 Hi,I have a mermaid tail from fin fun and it is the best thing I ever have in and it’s easy to use and I love the way the monofin moves and I know my mom didn’t waste her money on something that I wanted for so long. One of the monofins used in this video shoot was an older version. The first generation monofins used to be blue. Now they’re all black. Good eye! HI my daughter Emmie loves your mermaid outfits. Do you deliver to the UK? Where do you buy them.Is thar a store? I just got my finfun mermaid tail. YAY! I love it so so so much. I just got my finfun mermaid tail. YAY! I love it so so so much.It is really awesome! How do you make it? All I can think about is my mermaid tail!